The T Addict posted a pretty good piece yesterday about adding a gift in your package when a customer buys one of your t-shirts. I thought it is worth a mention because many times non-apparel companies do the same by packaging a t-shirt with the product they’re trying to move. This concept is just as effective in reverse, and I want to share two examples with you. First of all, why does this matter to you? If you think long and hard enough, you can probably find an opportunity where you can partner with a non-textile product as a cross promotion. There’s always some entity/industry out there that you could align your brand with and move some wears. These two examples don’t necessarily reflect that idea, but they do show the power of the tee in a good cross promo campaign. The first example is a limited edition t-shirt being sold by Clout Magazine as they release their 11th edition of the mag. The t-shirt print matches the cover of the magazine with some pretty sick artwork by renowned skateboard artist, Todd Bratrud. There is only 50 made and if you purchase one, the magazine comes with it for free. The other example is Burger King allowing you to design your own BK style vintage tee. This is one that might not sound too appealing to many people at first glance. However, they’ve executed the campaign/design so effectively, it almost makes you want to buy one. 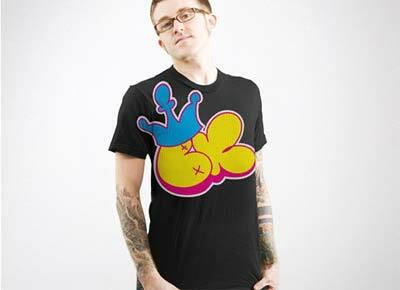 You could take the BK tee with a crown on it and the x’s (no doubt inspired by Kaws), and rep Brooklyn if you wanted to.